Congratulations to David Miller for reaching 1.5 million miles with CalArk! He has been with us for 14 of his 27 years in the Transportation Industry. David is on Karen Dennis's board and lives in Satsuma, Florida. When David is not driving he likes to hunt, fish, and ride his motorcycle. Other awards David has received during his tenure with CalArk include 100,000 through 900,000 safe driving miles, several 100% On Time Delivery Awards, a 5 Year Service Plaque, 1 Million Miles of Safe Driving, a 10 Year Service Award, 1.25 Million Mile Safe Driving Award, and Company Best Fuel Mileage in 2016. 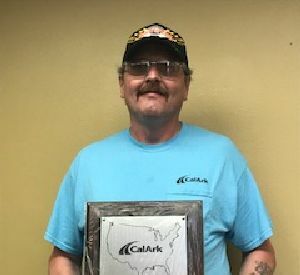 David serves as a trainer for new drivers entering CalArk's fleet, and this year he will represent our company at the Arkansas Trucking Association's Truck Driving Championship in Rogers, Arkansas. ​David likes to help his fellow drivers over the road whenever possible, and said if he has one piece of advice to share it would be to always "watch your mirrors" so you can anticipate what other drivers will do and you will have time to react. Given David's great safety performance, it appears always watching his mirrors works!